Usenet.nl - Review - Is this Netherlands Usenet Service Provider for you? Read Usent.com Review! Usenet.nl is a Netherlands based company known for its very fast downloads and good services. The company was started in 2009.The company offers the maximum speed to its users, thanks to five newsservers farms across the Europe. The company also offers the 3000 days of retention period which is one of the highest retention periods in Europe. The company provides access to more than 100,000 newsgroups. The Usenet.nl offers its own Newsreader to its users which is quite good and easy to use. The Usenet.nl is also compatible with the other well-known Newsreaders. When it comes to the privacy, Usenet.nl take it very seriously. The company provides the 256-bit SSL to its users for better online protection and data integrity. There have been several complaints about their Free Trial not being so free, so beware. The company offers two packages to its users, Compact and Relax. Compact package is the standard package by Usenet.nl. 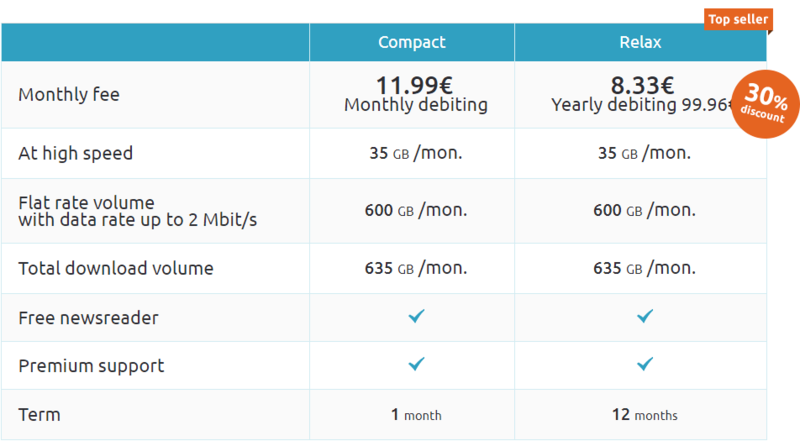 You can get the package for 11.99 euros per month. Package holders will be entitled to the following benefits. High Speed of 35 GB per month. Total download volume of 635 GB per month. Retention period of 30,000 days. Package valid for 1 month. Relax Package is the premium package by the Usenet.nl. Relax package is a yearly package. Package holders will be able to enjoy the 30% discount on relax package subscription. The package is available for 99.96 euros per year which is 8.33 euros per month. Package holders will be entitled to the following benefits. Package valid for 1 year. 10 GB volume with full DSL Bandwidth. You can start your free Trial by providing your personal and credit card details. You can also use the PayPal. The company offers the 3000 days of retention period which is sufficient. The retention period of Usenet.nl is also one of the highest retention periods in the region. Usenet.nl offers the high speed to its users. If you are not getting good speed, then try using another server. However, high speed is limited. You will get the high speed for first 35 GB only after that you will get the speed of 2 Mbit/s. Well, this is disappointing, as other Usenet Service providers offer the high-speed connection with no speed cap at very nominal price. Usenet.nl offers the 16 concurrent connections to its users. If you are pro user, you will be aware of the fact that a number of connections don't matter and the companies just mention it for advertisement. If you are new to the Usenet community, remember a number of connections don't matter. You only need few connections to max out your connection bandwidth. Usenet.nl Newsreader is available for both 32 and 64 bit Operating Systems. File Preview feature for both images and videos. Usenet.nl also support other major Newsreader Providers like HolmeZ and SABnzbd. Usenet.nl doesn’t offer VPN for its users. You can use the free VPNs available. Using VPN will make your online presence anonymous and will also bar your ISP from tracking your online activities. The Usenet.nl is committed to your privacy. The company’s privacy clear policy clearly states that the company doesn’t keep a log of your online activity. However, your ISP can so we would recommend you to use the VPN. The company uses the standard 256-bit SSL encryption for its users. SSL encryption encrypts the data at both user and server end to ensure the data integrity. Usenet.nl website has the dedicated FAQ section which answers the all common questions and problems. The company also have the dedicated customer support to serve you. You can contact the customer support on the phone at +1 877 257 3360. You can also contact the customer support through the form available in the support section of the website. The customer support will get back to you within 3-5 business days. In our research, we found out that customer support is not very responsive. Usenet.nl is an O.K Usenet service provider and it offers one of the highest retention periods in the region. The company is also committed to your privacy and doesn’t record your online activities. The company also offers the decent number of newsgroups access but still Usenet.nl lack the essential features of a good Usenet service provider. The company also has the reputation of “Scam Company” for charging its users for 1-year subscription during their trial period. In spite of the fact that it is clearly mentioned on the website that Usenet.nl won’t charge its users during the trial period, and users can end their trial anytime during the trial period. There has been alot of complaints about their Free Trial so beware. The company offers the high speed, but it is limited. You will be able to enjoy the full speed for limited data after which you will be restricted to the 2 Mbit/s speed. No one likes the metered connections. Our Best Usenet Providers offers the much better deal with no metered connections. We also felt that the price of the packages was also high when we compare the prices with our top Usenet service providers. The packages by Usenet.nl doesn’t offer good value for money. The company offers only two packages which don't cater the basic users. The company needs to work on their plans to make sure to cater every type of users. Our Best Usenet Providers offer the flexible plans for their users; some Usenet providers also enable the users to create their own Usenet plan using the plan customizer which is remarkable.